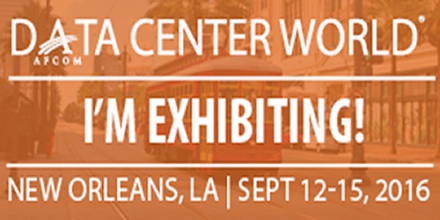 Sunbird will be participating at Data Center World in New Orleans (DCW NOLA) on September 12-15, 2016 at the Ernest N. Morial Convention Center. Stop by Booth #841 in the exhibit hall for a taste of features to come in the next version of our award-winning Data Center Infrastructure Management (DCIM) solution. Using DCIM for Data Center and Colocation Moves (Room R206; 1:00-2:00 PM): This panel discussion will focus on eliminating common mistakes when moving or migrating to another data center or colocation facility. Learn how to successfully move mission-critical applications and servers, examine key steps involved in successfully migrating a data center from one location to another, and explore how DCIM can help facilitate a move. The Future of Data Center Management: Panel Discussion on the State of DCIM (Room R206; 2:10-3:10 PM): Moderated by Jennifer Cooke, Research Director of IDC's Datacenter Trends & Strategies Group, this session will share proven advice on improving management of resources with DCIM. Featuring peer-engineered workshops, real-world case studies, and opportunities to network with data center experts, you won’t want to miss Data Center World in New Orleans. Heading to DCW NOLA and want to chat one-on-one with a DCIM expert? Sunbird representatives also will be available for individual meetings to help you explore if DCIM is right for you. Let us know if you’d like to meet. And don’t forget to drop by Booth #841 to deposit your Data Center World Raffle Ticket for a chance to win a GoPro Action Camera!